Why on earth did I ever think this fit well? 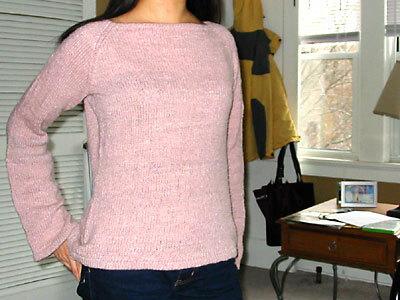 I love the fit of the new sweater, though I am a little bit concerned about the sleeve length. 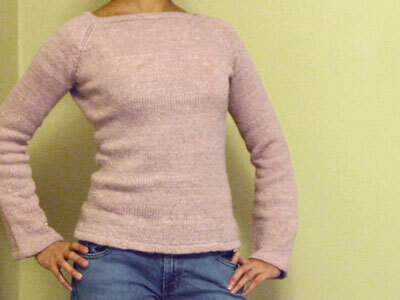 The length looks fine in the photo above, but the shoulders and upper arms stretched out as I wore the sweater, causing the sleeves to shorten. Ideally, I’d like to have another inch so the sleeves completely cover my wrists. I’m trying to block the sleeves a bit longer, but I can always take the sleeve apart in the middle and insert a few rows if I need to. I made a few minor adjustments to the pattern. First, I skipped all the turning rounds and did up all the hems as I went so the only seams I had to do were the underarm seams. Second, I worked two extra decrease rows at the neck so the opening wouldn’t be too wide. The main lesson learned from my adventures in knitting Hourglass twice: When in doubt, go small. It’s a lesson I’m slowly learning with my regular wardrobe as well. Fitted looks nice. Baggy looks sloppy. Negative ease is good, particularly in clothes that will stretch out with wear. On to Rogue, and NaKniSweMo! What Would a Sane Knitter Do? CogKnition posted this on November 5th, 2007 @ 1:37am in Finished Objects, Sweaters | Permalink to "Hourglass Sweater 2.0"
That is so much better! It’s beautiful. oh man, i am just learning that same lesson! just like you said, with both my own handmade garments and my store-bought ones, smaller is indeed better. i just frogged my 1/2 done wicked sweater and have restarted it for NaKniSweMo, this time size 32-35″ (even though i currently measure 38″). the negative ease lesson is a painful but necessary one, eh? The new version looks great! I’m surprised that the Cash Iroha held up to ripping and re-knitting, though. Good luck with NaKniSweMo–I’m doing it too. beautiful, and so simply put – if in doubt – go small! I love it! What a nice color. I have only seen Cash Iroha once in an actual store, and I don’t remember seeing that color. I bought it in red for the same sweater, which I also made much smaller than was given by instructions and it fits great (I did this because of all the bloggers who basically have said the same as you – smaller is better). I like how it came out so much, I am thinking of making another one very soon. Thanks for sharing yours! It looks great! I’m a little late to the party, but let me say how FABULOUS Hourglass looks on you! Congrats on a well-fitting sweater! Fantastic work.